When I learned we were having a girl I couldn’t wait to play dress up and put her in the most adorable outfits and shoes. Fake news! I was blessed with a chubby little munchkin who hates having her outfit changed, and her feet are so plump she didn’t wear shoes until recently (she’s 13 months). I still keep her barefoot while in the house because I am a huge supporter of barefoot walking for learning balance, but when we are out and about it’s necessary for her to have shoes on now that she is walking. I recently found Little Love Bug on IG and fell in love. Since ordering my first pair, I have ordered 3 more because they are that fantastic. Style- They are adorable! Ever notice that children’s shoes are ugly? Like, really really ugly? How am I supposed to match purple/yellow polka dot shoes with a pink sole? Not these! This was the original reason I purchased them. They look like adult shoes that I would buy in my size. There are so many different style options, from mocs in different colors and material, sandals, and sneakers. Price- Kid shoes are expensive! Sure, you can find cheap-o shoes but you’ll replace them in a month, because kids are hard on everything they own. I searched endlessly for quality shoes for “beginning walkers” that were under $50, and I kept coming up with very few options. Little Love Bug is perfect in price point, $30 is what most of their shoes are advertised for; however they run amazing BOGO sales and provide great discounts often. So pick a few pair and hold off for one of their great sales! Safe- I love the look of moccasins, but they can be slippery for new walkers. 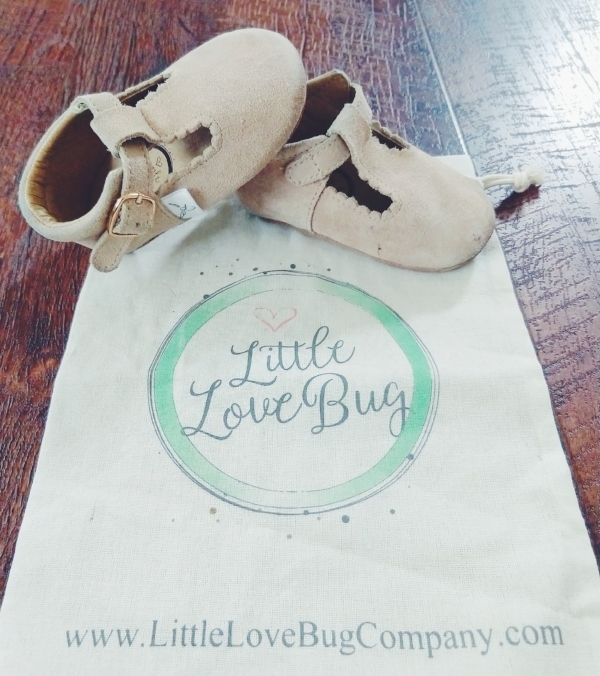 All of the soles on Little Love Bug shoes are anti-slip soles to prevent any tumbles. Customer Service- This is a small business, run by a fellow Mama. The customer service is suburb! She emails you directly to find out how you liked the product, it’s easy to change an order, and I feel better about spending my money on a small business product than handing it over to a major corporation. Packaging- I am a sucker for packaging. When a company spends a bit more time to package their product it makes me feel as if they take pride in my purchase. These shoes come with a little dust bag to store them in. Being totally honest, I don’t keep them in the bag but the bags come in handy for random toys in my diaper bag. Sizes- They come in various sizes making it easy for the design I fall in love with to stay in Audrey’s wardrobe for awhile. Audrey’s foot is small but oh so lusciously plump so finding shoes that don’t cut off circulation or make standing painful is hard. All four of my Little Love Bug shoes have been successful. Putting Them On- The only problem I have with some of the designs is they can take a bit of time to put on. Now, hear me out…I am a first time Mom, and avoided shoes until Audrey was 12 months. So I don’t have a ton of experience and I am positive that there is a ‘pro Mom hack’ at getting shoes on that I will eventually learn. Until then, I will most likely stick to the moccasin style that slip easily on and off. While, I adore the Chelsi boots, it takes me longer than 30 seconds to get them on my munchkins foot and she gets restless. But…for certain occasions I will take the extra time. I found this company on IG but ordered through their website. *Tip- Join their mailing list to get emailed promos and coupons! You won’t be sorry!! Disclosure: I am a paying customer of Little Love Bug Company and was not paid or compensated to write this review. If you are in the market for a play mat I can highly recommend this to you. 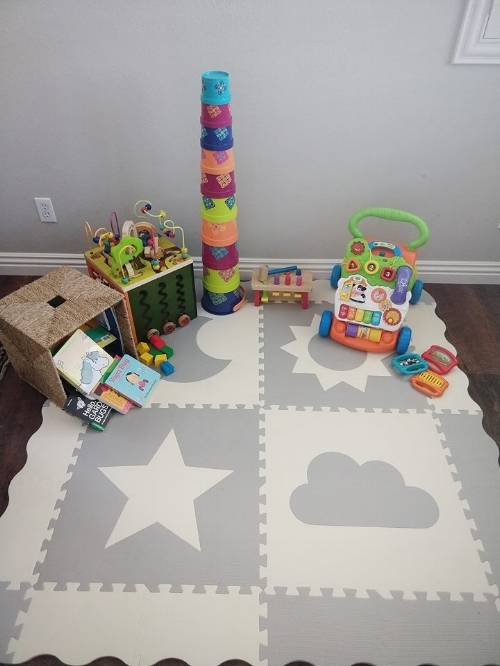 I was not a huge fan of play mats solely because I didn’t like the brightly colored foam tiles in my monochrome decorated house. I also don’t like having tons of baby stuff everywhere. This mat changed my opinion and has become a staple in Audrey’s bedroom. Size- The mat be fully assembled to 61’ x 61’ or disassembled to any size you desire. Easy Transport- The mat has a permanent residence in Audrey’s bedroom, but transporting it is a breeze. It comes with a sturdy cloth carrying case that mat pieces fit easily into. Comfy- The mat is 1/2 inch thick making it super comfortable to lay on. When it was living in our family room it was perfect for Audrey to play and me to do yoga on. Customer Service- Communication with Childlike Behavior is effortless. They even sent me an email to let me know that they were alerted my package was delivered so I could look out for it (porch pirates are the worst). Easy to clean- I run my Swiffer across it for easy cleaning. Collects Dust- It does collect a bit of dog hair and dust (don’t judge me, I live in the desert and it is dusty!) But, it is very easily cleaned with a Swiffer wipe or cloth. Amazon is the primary point of purchase for this mat.